This will be the third book in the Divergent trilogy, coming from Harper Collins in October. The cover fits well with the other UK covers but I’m afraid I do not like them. I think the three uk covers are really generic and I much prefer the US covers. The US Allegiant cover was revealed just a few days before the UK one and can be seen below. Strange Chemistry are a relatively new YA imprint and I think they are doing a great job of signing up amazing new authors. This week they announced that they were signing Danielle Jenson up for a three book deal, the first of which will be called Stolen Songbird and will be published in early 2014. The book sounds like an incredible epic fantasy and I am definitely looking forward to hearing more. You can visit Danielle at her website here and read the blurb to Stolen Songbird below. But something strange happens while she’s waiting – she begins to fall in love with the handsome, thoughtful troll prince that she has been bonded and married to. She begins to make friends. And she begins to see that she may be the only hope for the half-bloods – part troll/part human creatures who are slaves to the full-blooded trolls. There is a rebellion brewing. And her prince, Tristan, the future king, is its secret leader. 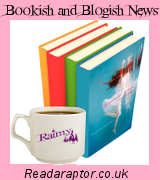 Readaraptor is A Daydreamer’s Thoughts’ Blogger Spotlight! I am over on Faye’s blog, A Daydreamer’s Thoughts, today as part of her monthly blogger spotlight. The post involves a lovely Q&A between me and Faye and I just want to say a huge thank you to Faye for having Readaraptor as her monthly blogger spotlight! So looking forward to Allegiant!